Vitus vitesse evo Cri ultegra (R8000) Di2 £1849.99 (£1665 with British cycling discount). Seems a decent price for a carbon frame with Shimano Ultegra Di2 groupset. EDIT: Thanks to Aleik for pointing out TCB of £37. Very recent review by road.cc‌ Here, weight listed as 7.57kg for those interested. Get a Dacia for that price!! Yes but can you justify wearing that tight Lycra in your Dacia? Cracking price. Surely the gruppo is worth over a grand alone? No indication of weight, but the overall component quality is decent. Might be worth investing in some higher quality finishing kit. The disc version is advertised as 7.99kg so this may be slightly lighter? I stand corrected, this version comes in at 8.4kg according to the specs. Good bike and good kit for that money. The Prime wheels are decent too, Fizik/Ritchey kit too. Get in for the discount! and come on Geraint isn't it, first win for Wales please. Proper bargain even without the discount. Groupset is £1100 and carbon wheels £400. Add on finishing kit and tyres for another £200 and that make the frame almost free! Seems a little heavy but not too much. Equivalent Canyon Endurace is £300 more but weights 700g less. Will also hold its value better but the wheels don't looks as bling! Bargain, great group set , pretty good wheels. 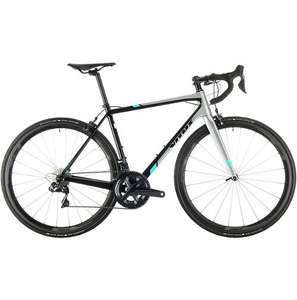 Finally ordered after having it in my basket all day yesterday should be a decent upgrade on the 2014 model avanti giro 3 I currently use. Probably sell the wheels to recoup a bit of the outlay as I don't think they'll be much of an upgrade over the hunt alloy wheelset + conti gp 4000's I'm using now. Thats a whole lot of spec for a low price. What do I have to do to get the discount? I think there might be deal on here somewhere for discounted membership. Discounted (or possibly free) membership. Decent spec for the price, not that light but then again not tooo bad. Just lose a kg or 2 yourself. Quite tempted! Whats the max speed of this and how many miles do you get out of 2 charge? Quite tempted! Whats the max speed of this and how many miles do you get …Quite tempted! Whats the max speed of this and how many miles do you get out of 2 charge? Seems a bit heavy given the spec of the main components. For instance my recently purchased full Boardman SL full 105 spec came in just under 8kg and was £600 cheaper. However for this deal, @ £1665 its incredible value for money, a good £35 cheaper than the nearest similarly specced bike (merlincycles.com/rid…tml?source=PHG) and i'd rather have the Vitus than a Ridley Fenix SL. Have some heat sir!! Presumably the listed weight is for the median frame size? As with shoes, I'm almost edged out of the market, needing the 62cm frame...which they stock. YUUUUGELY tempted. Is this last years 6800 Ultegra, or the new R8000? I've tried looking from the image, but can't make it out. Is this last years 6800 Ultegra, or the new R8000?I've tried looking from …Is this last years 6800 Ultegra, or the new R8000?I've tried looking from the image, but can't make it out. I had assumed it was the 6800, but no, its the R8000. CRC website lists it as "Vitus Vitesse Evo CRi Road Bike - Ultegra Di2 2018"
I think that spec page is not quite right as it lists R8070 which is the hydraulic disc part rather than the rim brake part which is R8050 but definitely looks like an R8050 groupset which is impressive as I thought this would be the older 6870 which is going cheaper these days. Can it keep up with my Planet X Carbon over a 100 miles? Prob not. Can it do 48mph downhill like my Planet X carbon? Prob not.... are you a machine like me? Prob not.... so go buy it! No, most don't these days. I suspect it's because most folk use clipless pedals (and often have more than one bike), so stick with the same pedals on each bike. Can it keep up with my Planet X Carbon over a 100 miles? Prob not. Can it …Can it keep up with my Planet X Carbon over a 100 miles? Prob not. Can it do 48mph downhill like my Planet X carbon? Prob not.... are you a machine like me? Prob not.... so go buy it! No, most don't these days. I suspect it's because most folk use clipless …No, most don't these days. I suspect it's because most folk use clipless pedals (and often have more than one bike), so stick with the same pedals on each bike. Don't forget, as always, 2% cashy backery TCB. £37. WALLOP. You need to become a member of British Cycling …You need to become a member of British Cycling https://www.britishcycling.org.uk/membershipI think there might be deal on here somewhere for discounted membership. How do I justify this? Commute or pleasure? Racing? Why is it £1618 for Guernsey? Just been reviewed by Road.cc, has the weight as 7.57kg! Looking forward for mine to arrive!! Just been reviewed by Road.cc, has the weight as …Just been reviewed by Road.cc, has the weight as 7.57kg!https://road.cc/content/review/245737-vitus-vitesse-evo-cri-ultegra-di2Looking forward for mine to arrive!! Was just about to post that link as well. Gets a very decent review and that weight seems far more akin to the spec. Genuine bargain. Enjoy!! That weight sounds much more like it, I did think it seemed (relatively) heavy for the spec and couldn't work out where the weight came from.